Have a look above. 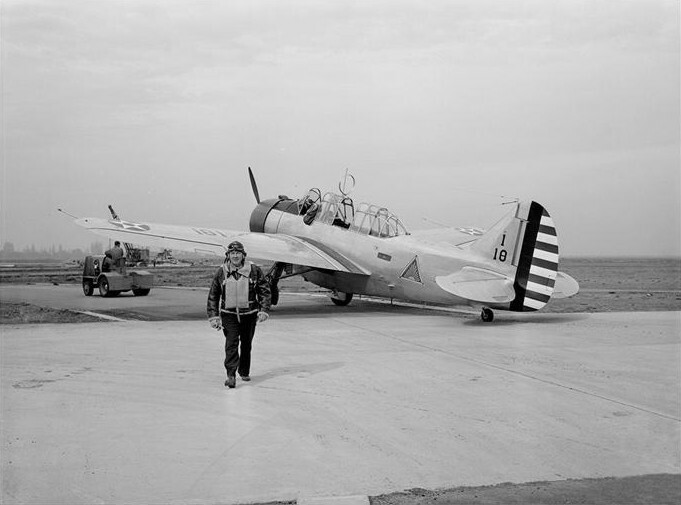 It’s the B-18 Bolo the Army Air Force used to photograph Pearl Harbor on December 9, 1941. Ugly airplane, even uglier day. 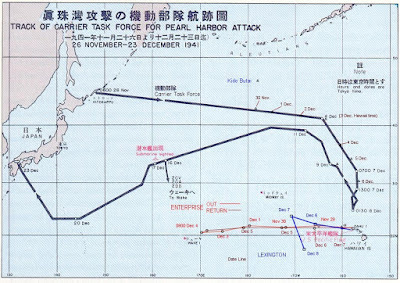 In case your history teacher let you down, December 9th’s significance is that it was two days after the Japanese attack on the Navy port of Pearl Harbor, Hawaii. Last week, I had the chance to talk to one of the day’s few remaining survivors, Stanley Lieberman of the 86th Observation Squadron. 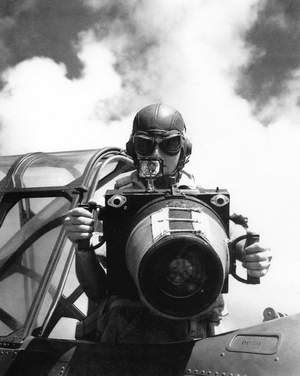 He was an aerial photographer that “shot” from the back of the guppy-shaped 0-47. But as fate would have it, his sole experience in combat would take place on the ground at Wheeler Field, Oahu, during the attack. 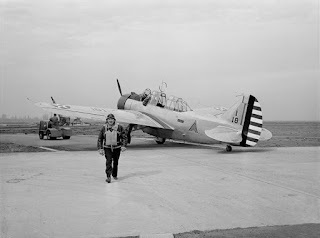 His sole battlefield experience would occur over the harbor itself in the B-18 shown above. O-47 Observation airplane. Obsolete at the time of the start of WWII - didn't see combat. The opportunity's timing was uncanny—it came to me a week before the attack’s 74th Anniversary and thus thought it a great way to commemorate the day. 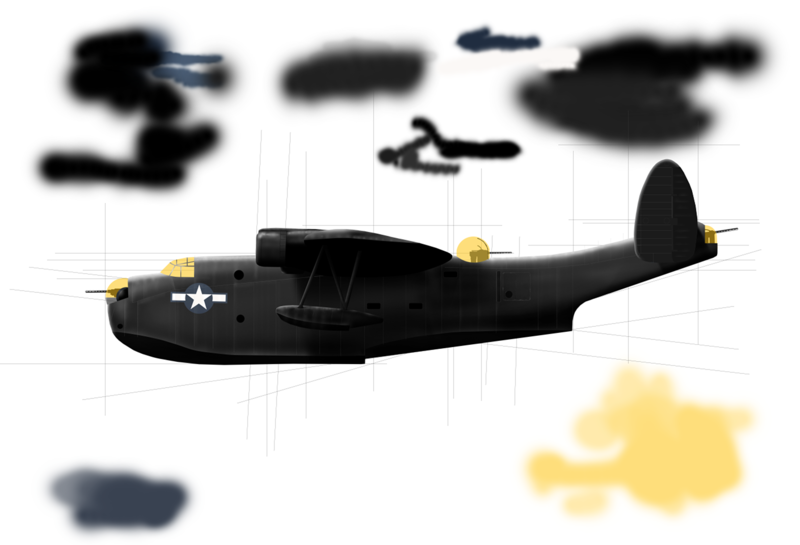 However, with so little time to interview Stan, research the moment and draw the airplane, I am afraid the haste may have showed up in my work. It doesn't matter. Back to Stan. Of course, I had to ask the question, “What was it like? !” The man has been asked this question hundreds of times over the years but I was surprised at the thoughtfulness and generosity of his answer. He spoke, not with from rote reply but with surprising spark and emotion. He wanted me to know. 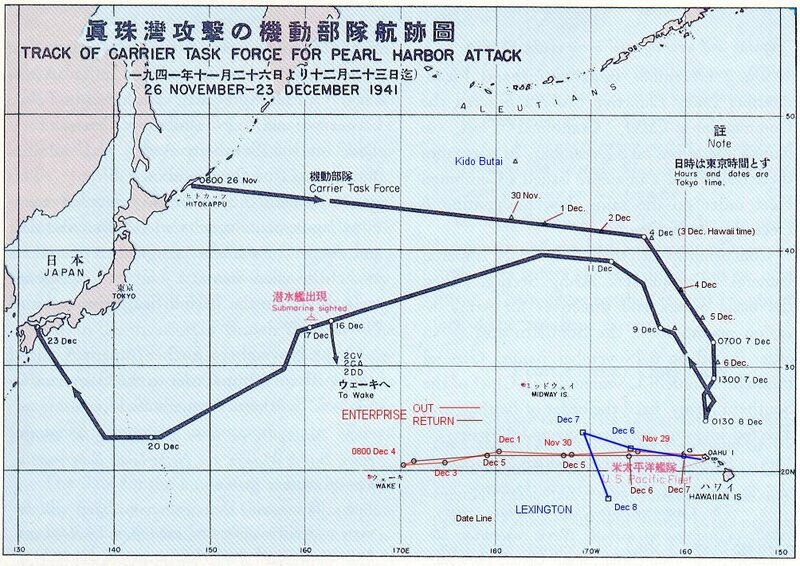 This is an awesome map of the Japanese' Task Force's trip to Pearl and back. It took them a month. It also shows the position of the American Lexington and Enterprise carriers. Today, this wouldn't happen. But then again, who's attacking us with aircraft carriers these days? 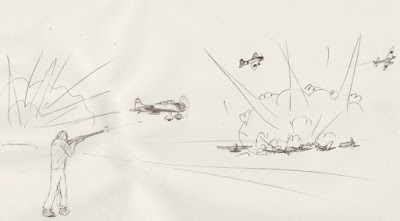 Wheeler Field was the first “official” target of the Japanese; the scores of American aircraft lined up in perfectly straight rows were outrageously simple targets for the Japanese aircraft to strafe and bomb. According to Stan, the aircraft had been properly dispersed the prior week but the day before the attack, were lined up as if on parade and fueled. 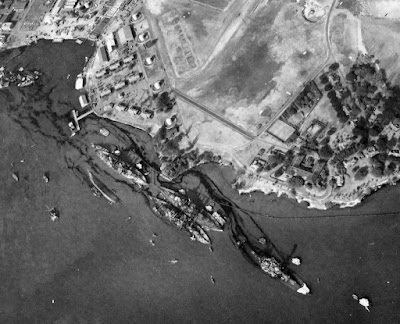 The "infamy" of Pearl Harbor was as much a product of poor planning as it was the attack itself. "Did you know what (the explosion) was? Who it came from?" "No! But we figured it out quickly!” I remember getting into a group of five guys and heading to the armaments shack. So we could get guns. It was a little room inside one of the buildings, surrounded by chickenwire—rifles, guns on a rack—and there was a .50 cal machine gun in there, too. Only there was a Sergeant in front, standing guard, and we came in there, asked for the guns and that Sergeant says, (Stan pauses and chuckles with incredulity) 'I can't release these guns without the signature of an officer!" I wanted to ask about the hapless Sergeant but it was apparent that the pedantic bureaucrat was overruled if not overpowered. Browning M1921 liquid cooled .50 cal. It wasn't popular, it wasn't common but it was available. "We (set up the machine gun). One of the guys had ran off to grab some .50 caliber belts from (the airplanes) and we lifted the top (of the gun) loaded the ammo and started firing (at the Japanese airplanes strafing the airfield). I was supposed to keep the belt straight as it fed into the gun (to keep it from kinking and jamming). We got off about 30 rounds before the gun stopped. (The gun) was liquid cooled and we didn't know to hook it up to water." "So what did you do then?!" See if you can imagine the moment; the Doppler blat of airplane engines, crackling staccato of machine gun fire, thump of explosions and the hiss and tinkle of debris and shrapnel…who prepares for this?! “I’d never fired a gun in my life! The airplanes were low. And close. I could have hit one with a shotgun. And slow (flying) about 80, 90 miles per hour. I remember one flew by me, strafing, and seeing the faces (of the pilot and gunner). I could see their faces! This is a ridiculous sketch I made while sorting through the story. After the war, Stan learned to love hunting and he stated that he'd wished he'd had the shooting skills then that he'd acquired later. Back to the B-18. Have another look. Stan Lieberman in the back of the O-47. He wasn't flying in this type on December 9 but he was using that kind of camera. “That morning (December 9), I was told, get your (camera) gear. We’re going up. And we walked out to a B-18. They were still bulldozing the burned up airplanes (at Wheeler Field). I had indeed read of the survivors, trying to signal people on the outside, desperately clanging whatever they could to attract help. The idea that sailors were forever trapped inside the bowels of these huge ships, unable to be rescued, is disturbing to say the least. Pearl Harbor, from the air. I couldn't find a source but it's supposedly taken on December 10, 1941. Maybe it was one of Stan's and incorrectly dated? Who knows. "Don't know. And I would sure like to see them. As far as I know, the photos I took for the Army (Air Force) haven't been published. But they were good pictures, I'm sure." I spent some time looking through the wilds of the internet, hoping to see aerial shots of Pearl Harbor with an Army or Air Force credit but came up short. Somehow, someway, the Navy won the credits and their excellent work remains in the official record. Could one of Stan's shots been appropriated? Maybe, but who can know? All I know is that it'd have been so cool to have found them and deliver the man's work, 74 years later. Instead, for now, this rush-job B-18 has to suffice. Yet, there's a strange reassurance that comes when history is still with you as Stan is. One of my friends illustrated this when, after I told him I was talking to (another)**** Pearl Harbor vet, he exclaimed, "Cool! I didn't think there were that many around! That's great!" It was as if he were acknowledging that the world was somehow a better place because of Stan (and others) mere presence. Perhaps it's just the tendency for people to be attracted to nostalgia. But I can tell you this—thinking of a day when we don't remember December 7th's significance is not reassuring at all. And to that end, Stan (and Cass), I hope you live forever. 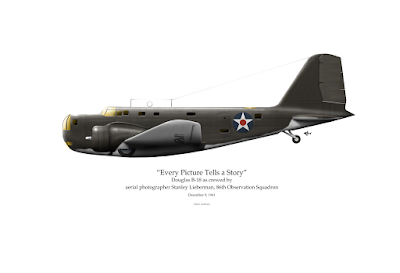 To own a print of Stan's B-18 (autographed by Stan) click here. 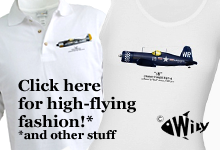 *During the night of December 7, five Navy F4F Wildcats were shot down by nervous anti-aircraft gunners. Three pilots were killed. ***429 aboard the Oklahoma died, comprising a sixth of the total number of Americans who were killed in the attack (2,471 killed, 1,203 wounded). That's a LOT of black! Considering the PBM Mariner was nearly 30' longer and 5 tons heavier than a B-25, it should be a lot of black, too. And that's the problem. I've drawn, re-drawn and re-drawn this best at least three times. But that's no big deal because today, December 7, 2015, has more to do with the above airplane's pilot than the airplane he would fly. See, Cass Phillips is one of the few alive today who can remember the Japanese attack on Pearl Harbor. So, though the airplane above will probably change some more, her pilot's memories—I hope—will remain with us forever. VPB pilot Cass Phillips remembers "Pearl Harbor"